Brackeys Game Jam #2 community · Posted in Congratulations! During the jam, I worked 4 hours maximum every day of the week. I was really busy with work related stuff during the jam, so I did not make much progress on weekdays. If you are interested, you can rate my game here: https://d-studios.itch.io/imperceptive-lover. I am sadly pretty busy so I may not be able to rate many games. Brackeys Game Jam #2 community · Posted in I'd like to play your game! Here is my game: https://d-studios.itch.io/imperceptive-lover. I might play your game if I get time. I am sadly pretty busy. Brackeys Game Jam #2 community · Posted in Rate trade! Here is my game : https://d-studios.itch.io/imperceptive-lover. I might play your game if I get time. I sadly am pretty busy. I have played and rated this Brackeys Game Jam #2 entry. * I liked the pixelated graphical style of the game, especially the art of the sun. * The game is too hard and I am unable to get a score above zero even in the easiest difficulty in the game. I too participated in the Brackeys Game Jam #2. I would be very grateful if you would rate my game. The game was worked on by a team of 5. Thanks for playing! Brackeys Game Jam #2 community · Posted in Trading Ratings! Just post your game in the comments below. If I get time, I might play it. Interesting game. I like the mechanic in where the colors of the players switches. I however think the music is extremely repetitive and the loop is too short. You are allowed to fix glitches in your game and publish it as a post jam version. Players will then be allowed to rate the post jam rather than the original glitchy version. The post jam can only have bug fixes though if you want it to be rated. The post jam goes on the same page as the original jam entry. It is just another downloadable file. * I liked the animation in the game. The walking style, the idle style, and the running style of the player looked very realistic in the game. I liked this. I also thought the enemy animations looked good. These animations made the game seem more professional and polished. These animations made me more immersed with the gameplay experience and made me feel happier while playing the game. * The audio was good. I liked the soundtrack. The soundtracks sounded nice to listen to and they did not sound repetitive. The sound effects sounded realistic and were a nice touch of polish to the game. The polish the sound effects added made me feel happier playing the game and immersed me more into the gameplay experience. The sound effects that play when the player got hurt were so loud that the sound effects scared me. I liked these sound effects because they sounded nice and because they scared me. I feel it is appropriate that these sound effects scared me as they play after I got hurt. These sound effects conditioned me to be scared when I got hurt. I feel it is appropriate that the player gets scared when the player gets hurt. * I liked how you tried to be somewhat creative in this game. I liked the usage of the black hole teleportation mechanic and the flashlight mechanic. These mechanics are uncommon in many games and I liked how you tried to be different in this game. * I believe that the tutorial should have been integrated into the levels in the game so that the player can have a better understanding of the tools and mechanics they are given to work with. When I was playing, I memorized the instructions on the How To Play section. However, when I first started playing, I did not know that I had to turn on my flash light. I did not know I was in a dark area in where I could turn on my flashlight. Also, for a long time, I did not know that the rotating roundish black objects in the game were black holes. Therefore, I did not know that I could enter through them. * The levels of this game should be finely play tested before being officially released as the final product. I was unable to beat the first level of the game since I did not know where to go. When I went through the first black hole, I kept on falling back to the floor. Try having multiple people playtest your game (preferably people who do not have biases towards you and will be honest with you) and try to see how the playtesters play. If playtesters get confused on where to go, you know you have to fix the game and make it more evident on how to progress through the game. Otherwise, when the game releases, players will get angry as they will not know where to go. * The recharging rate of the flashlight is way too slow in this game. I was initially trying to be more efficient in gameplay rather than trying to have fun. Most players try to be more efficient in gameplay rather than try to have fun. Since I was trying to be the most efficient I could initially, I decided to wait until my flashlight recharged to 100% at the flashlight charging station. My flashlight was initially at 0%. The wait was so long. This wait made me feel bored as there was no challenge and it was just a waste of time doing nothing. * I wish there was a mechanic in the game that allowed the player to restart. Sometimes when playing, I would mess up so badly I would just want to restart so I could have all of my lives. Unfortunately, the only way to get all my lives back again was to continuously damage myself until I killed myself. This was frustrating as it was a waste of time for me. I did not have fun continuously killing myself. I also wanted to restart multiple times, so there were a lot of times in where I continuously killed myself. * I do not fully like the way damage and death is dealt with. I particularly do not like that the player can push the enemy when touching the enemy. The player may try to use this mechanic to take an unintended advantage in the game. I also do not like how death is dealt with. When the player dies, the character for some reason just automatically runs to the right. Also, one time the player was running to the right pushing an enemy and sound effects that play when the player gets hurt were continuously playing. I also do not like that a black hole in the first level is covering some of the Play Again button's space. This makes the game feel more unprofessional and unpolished, and this ruins the gameplay experience for me and makes me feel less immersed into the experience. * There should be a way for the player to return to the main menu. During the gameplay, I wanted to return to the main menu to explore the UI menus. However, I was not able to. There really should be a way for the player to return back to the main menu. * Teleporting in black holes in this game seems glitched. For some reason, the black holes shift the player to the left a little bit. When I traveled through the first black hole in the first level, I spawned a little left to the platform that I was supposed to spawn on. Therefore, I just ended up falling to the ground. I was unable to progress further through the level because of this black hole. * The pixelated text was kind of hard to read and was very illegible. A person with eye problems might even have a harder time. Try making the text look clearer so players do not have to strain their eyes to read the text. * The writing in this game needs to be proofread. I found many areas in where some letters should have been capitalized. *One key really should not have two functions. I know pressing a key and holding a key are different, but the player still might accidentally activate the other function rather than the intended function with the one key. * The name of this game is Astronight, but when opening the application, a different name is written next to the Unity icon in the application. This name written next to the Unity icon is clearly not a clear formal name for the game. This inconsistency between these two names looks unprofessional and this frankly ruins my immersion into the game. * When the player first opens the game, the player is prompted with a configuration window. The configuration window allows the player to change the screen resolution. When the player is prompted with the configuration window, the player may change the screen resolution to create a smaller window for the game rather than playing with the default screen resolution. This may cause the UI to act strangely during gameplay. When I played this game with the smallest screen resolution possible, I found that the UI icons during gameplay were way too big. The other UI elements were fine though. Thought it is possible to make the UI adaptable to changes in screen resolution, I would strongly recommend removing the configuration window in Unity. You may want to remove the configuration window because of the input screen in the configuration window. The input screen may confuse some players due to there being a lot of information. The input screen is not exactly explained too well, and it can be overwhelming and a burden to players. Also, your game allows the player to change the values of the game's controls in the input menu. This is a problem because if the player is able to make changes to the controls of the game, the game's tutorial will still show the player that the default values of the controls are the values of the controls even though that might not be true since the player could have changed some of the controls. Also, another problem is that the player can make changes to the controls so that two or more controls share the same key. Whenever the player uses this key, the player will execute all of the controls that share this key. This can cause some problems as the player may only want to use one of the controls when pressing the key. However, this would not be possible to do since the player made two or more controls share the same key. Therefore, completing the game could be impossible or at least very hard to do if the player makes two or more controls share the same key since the game might expect that exactly one of the multiple controls that shares the same key is executed in specific instances. * The art style of the game was interesting. I liked the sketches and animations of the characters. I also like how the game starts with a camera zoomed in on a coconut, and then the camera zooms out when the player press the space bar to play. I liked how the camera moved to show the image that had the text "SUCCESS" when the player won. I also liked how the camera zoomed in a hidden disappointed face on the tree when the player lost. * The audio was great. The audio made me feel like I was in a beach paradise. The soundtrack was nice to listen to and it was not repetitive. I liked the sound that played when I won because it made me feel like I was good at the game. I also liked the sound that played when I lost because it made me feel bad for losing in the game and it made me want to do better in the next try. * This game is way too short and easy. There should be more levels that try and test the mechanics of the game. These mechanics should test the player's skill in making important strategic decisions and make the player feel good when winning levels. Instead, this game is only just one easy level that can be beaten in less than a minute. This causes the game to not be very engaging. The player will not feel too happy when completing this game as the gameplay experience is way too short and therefore barely meaningful. * The game should allow the player to drop coconuts in whatever order the player fancies. This way, the player can use even more strategy to win the game. It is unfair that the game does not even tell the player the order of the dropping of coconuts. Not knowing the order can lead to defeat and this can be frustrating for the player if the player loses. This is because the player lost unfairly as the player did not know what should have been relevant information. Since having an already picked order of coconuts makes the player feel too limited in choices during gameplay, you should allow the player to pick which coconut the player wants to drop every time the player has to drop a coconut so the player can make interesting and strategic decisions. * Whenever the player wins or loses a game, the game should just automatically restart the game. The player should not have to waste time manually pressing a button to restart the game when the game can do that for the player. Making the game automatically restart itself will be beneficial to the player and will make the player happier with the game and more immersed into the gameplay experience. *There is this glitch in that if the player drops another coconut once the player wins the game, the sound that plays when the player wins stops playing when the coconut is dropped. * The configuration window should be removed. This is because it has input settings. In this game, it seems you like you did not use any commands related to Input.GetAxis. This means that changing the settings in the input settings of the configuration window will not change the controls of the game. Therefore, the input window should be removed as it is useless in gameplay. The input window should also be removed because there is a lot of information there that might confuse the player. This confusion can frustrate the player and put a burden on the player. Therefore, the input window should be removed. The input window can only be removed if the configuration window is removed. Therefore, the configuration window should be removed. * The gameplay was challenging. The challenging gameplay and the tension that I felt when a lot of enemies starting coming in made this game feel fun. I really like how each match starts easy, but then becomes harder as time goes by. * The rules of the game were easy to understand. Once I learned the controls, I easily learned the rules of the game. I was able to finish the learning phase of the game very fast and get to the fun portions of the game. * I liked the gameplay mechanic in where the harmless enemies become harmful and the harmful enemies become harmless. One concept that I appreciated about your game is that rather than trying to do something very simple and easy to do for the core of the game, you tried to make the game's core more interesting and creative. This mechanic adds a layer of strategy and depth in this game. In the game, the player must have strategy to know when to kill a harmful enemy so that a harmless enemy doesn't immediately damage the core when becoming a harmful enemy. This added layer of strategy makes the game more fun for the player. *I like how each match of the game starts. The beginning of each match allows the player to be launched in the game. Also, in the beginning of a match, there are not many enemies. I like these details about the beginning of the match because these details allow the player to feel relaxed and give the player a break after losing a match. In this way, the player can become more aware of the current surroundings and can perform more efficiently in the match. This makes the game more fun for the player. * This game needs more UI elements and scenes. This game needs a Main Menu, a Credits, and a How To Play Scene. Adding multiple scenes in a game can make the game look more professional and polished. Making a game more polished can make a player more immersed into the gameplay experience and can make the player happier with the game. Also, this game really needs a How To Play UI screen even though the game page explains the controls. This is because a player might forget the controls on the game page while playing the game. For example, when I was playing the game, I forgot which buttons I could press to launch off. Also, having the instructions of the game not be told in the game and rather told on a game page is considered unprofessional today. This can ruin player experience and immersion into the game. By adding a How To Play UI screen, players can learn how to play the game quicker than by reading the game instructions on a game page and can get to the fun portions of the game more quickly. * The player's movements needs to be fine-tuned. The player moves way too fast in this game. This is frustrating because it is hard for the player to control the player's character. This makes the gameplay unnecessarily frustrating as more ships are more likely to damage the core since it is hard for the player to control the character to hit the ships because the movement is way too fast. * There is a lack of audio in the game. First of all, having a soundtrack would really give the game a mood, have the players feel something, and care about the gameplay experience. In addition, listening to a soundtrack that is good is nice and can make a player feel happier with the game. Having some sound effects would also be a nice touch of polish and the sound effects can help the player be more immersed with the gameplay experience. In addition, sound effects can also help the player with the game. By using sound effects, you could give the user audio cues of what is happening during the gameplay experience. For example, if a sound effect that is played when the core gets hit by a harmful enemy is played during gameplay, the player knows that the core got hit by a harmful enemy. *There should be boundaries in this game that restrict the player from going off screen. This is because once the player goes off screen, it is hard for the player to come back on screen again. 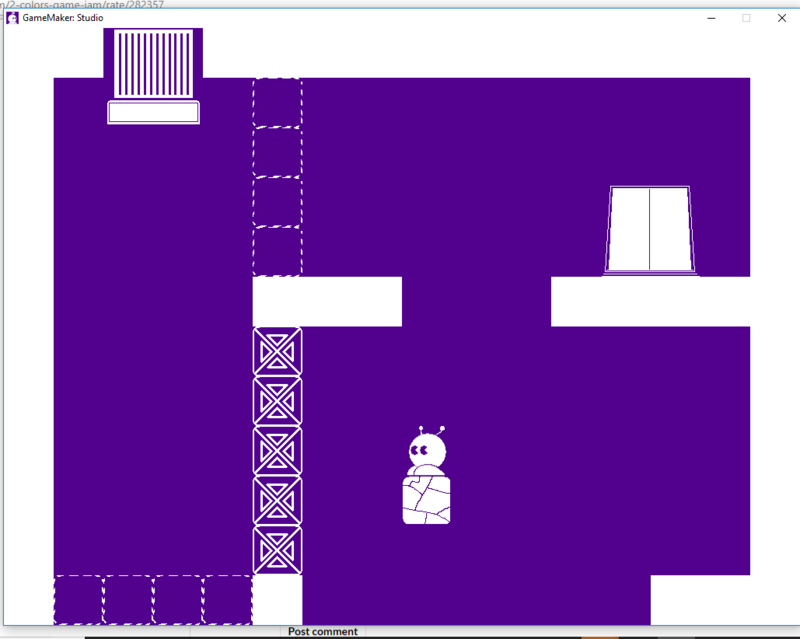 This is because the player can not see the player's character, and therefore it is hard for the player to come back on screen in a timely manner. The fast movement of the character in this game makes it even less likely that the player will be able to get on screen in a timely manner. The farther away the player travels from the screen, the greater the chance that the player will not get back on screen in a timely manner. If the player can not get back on screen in a timely manner, the harmful enemies might be able to destroy a defenseless core. It is possible to remove the configuration window. I use Unity. To turn off the configuration window, you will have to go into the player settings and change some values. * When I finally understood the controls, I found it fun to just fly around and explore in the game. * At the beginning of the game, I had a hard time knowing where I was. I did not understand what the two orange lines that were near me were supposed to do. Also, I thought the design of the ship was strange. I also found it out hard to move. This is because I thought that there was a certain button to move forward that was different from the boost button. I later on found that the boost button was the move forward button. Sometimes the ship would just move forward without me pressing any buttons. I found this frustrating because it did not make me feel in control of the ship. * The controls of the game are weird and strange. They are not conventional and are inconvenient. They way the controls are laid out forces me to only use two buttons with my right hand. It also forces me to use only six buttons with my left handed. Also, the WASD keys and arrow keys were kind of not used conventionally in this game. In conventional standards, the W key and the up arrow key usually relates to upward movement, the S key and the down arrow key usually relates to downward movement (or no movement in some games), the A key and left arrow key refers to leftward movement, and the D key and right arrow key relates to rightward movement. The W and S keys and up and down arrow keys are used conventionally since the W key and up arrow key is related to upward movement and the S key and down arrow key is related to downward movement. However, the A and D keys and left arrow and right arrow keys were not really used conventionally. In conventional standards, these keys would probably turn the ship left or right and not spin it. When I was playing this game, I was frequently using the A and D keys trying to turn the ship as I am used to the WASD keys being used conventionally, but I kept on accidentally spinning it. This was frustrating and annoying as I did not want to spin my ship. I wanted to turn it. * The ship's movements needs to be fine-tuned and adjusted. The ship is a little too slow in moving forward. The ship is a little too fast in tilting, spinning, and turning. I did not like the ship's movements. It made it hard for me to feel in control of the ship. Whenever I needed to tilt, spin or turn, the ship went too fast and the ship ended up moving too much. Whenever I wanted to move forward, it moved to slow and the gameplay experience became boring. * The combat system in this game needs to be better. In this game, I can not aim my gun properly at enemies and therefore it is hard to damage enemies as my bullets frequently miss my targets when shooting due to the terrible aiming in this game. I do not know how I take damage from enemies. This is frustrating as the combat system does not provide a layer of challenge that makes the game fun. It is just pure frustrating. *There is a lack of audio in the game. First of all, having a soundtrack would really give the game a mood, have the players feel something, and care about the gameplay experience. In addition, listening to a soundtrack that is good is nice and can make a player feel happier with the game. Having some sound effects would also be a nice touch of polish and the sound effects can help the player be more immersed with the gameplay experience. In addition, sound effects can also help the player with the game. For example, many of the times, I did not know if I got hit by an enemy. Many of the times, I did not know if I hit an enemy. By using sound effects, you could give the user audio cues of what is happening during the gameplay experience. For example, if a sound effect that is played when the player gets hurt is played during gameplay, the player knows that the player got hit by an enemy. * The game needs more UI screens. The only UI screen in the game is a main menu. This game needs a Game Over, a Credits, and a How To Play UI screens. Adding multiple UI screens in a game can make the game look more professional and polished. Making a game more polished can make a player more immersed into the gameplay experience and can make the player happier with the game. Also, this game really needs a How To Play UI screen even though the game page explains the controls. This is because the game also needs to explain the gameplay rules. For example, I thought the planets in this game were enemies and I tried shooting them. Also, the game did not talk about alternative controls. For example, the player could use the arrow keys instead of the WASD keys in the game. Also, having the instructions of the game not be told in the game and rather told on a game page is considered unprofessional today. This can ruin player experience and immersion into the game. By adding a How To Play UI screen, players can learn how to play the game quicker than by reading the game instructions on a game page and can get to the fun portions of the game more quickly. * When first opening the game, the player is prompted a configuration window. The configuration window allows the player to change the screen resolution. Changing the screen resolution of the game to create a smaller window compared to the default screen resolution may cause some of the objects in the game to not be visible on screen when playing, as the window may be too small to show them. I would strongly recommend removing the configuration window in Unity because allowing the player to change screen resolution may crop some objects in the game out of the screen. In addition, you may also want to remove the configuration window because of the input screen in the configuration window. When a player modifies the values of the controls, the player might forget what values the player put. This would be bad because only the default values of the controls are told on the game page. Therefore, if the player forgets what values the player inputted for the controls, there won't be a way for the player to get access to these values during the game and this can be frustrating for the player. It can be frustrating because the player will then have to find out the controls through a process of trial and error. The player can also just exit out of the application and open it up again. Then, the player can look at the values of the controls in the input window to find out what values the player put in. Another problem with the input menu is that if the player puts the same value for two or more different controls, the game can react strangely. If the player sets the same value for multiple controls, the player will execute those controls every time the player uses that value. This can be bad because a player may want to execute only one of those controls, but the player won't be able to. This can make the player frustrated as the player may not feel in control of the game. The input screen may even confuse some players due to there being a lot of information in the input screen. The input screen is not exactly explained too well, and it can be overwhelming and a burden to players. In case you are wondering, it is possible to remove the configuration window in your game. *If there are not any boundaries that restrict the space the player can travel in the game, there should be. This is because it is possible for the player to fly too far away from the place with planets and enemies. Returning back to this place can take a long time. Flying a long time without having a sense of exploration would be frustrating and boring. *Your game is at least trying to be innovative. This game featured features like curved bullets and limited recycled ammo. These features are uncommon compared to the other space shooter games that I have played/heard of. * The usage of the mouse was effectively used. I liked how the mouse can command what direction the bullets should go. This is a feature that would be hard to do by using a keyboard key. It is good that you used a mouse to implement this feature. This is because the mouse can point at precise locations, which can allow the player to aim their weapon more precisely. * The screen looks way too hectic. There are so many objects in the game with the same color and it is very hard to distinguish which object is which, especially with how the player and enemies fade in and fade out in the screen. Sometimes, I do not even know where the player is. The screen is way too hectic, but it is probably even more hectic for people who have eye problems. *These days, I do not really like endless runner like games in where the player can not actually win and finish the game. This is because the gameplay can get boring real fast as the gameplay can be pretty repetitive. In this game, there is no variety of enemies. Therefore, the gameplay can easily become really repetitive. There is also not a very strong incentive in this game that motivates me to try my best. I do not really feel happy when I reach a good score because my work in this game is never finished. I never feel a final sense of accomplishment. *There is a lack of audio in the game. First of all, having a soundtrack would really give the game a mood, have the players feel something, and care about the gameplay experience. In addition, listening to a soundtrack that is good is nice and can make a player happier with the game. Having some sound effects would also be a nice touch of polish and help the player be more immersed with the gameplay experience. In addition, sound effects can also help the player with the game. For example, many of the times, I did not know if I got hit by an enemy. Many of the times, I did not know if I hit an enemy. This is largely due to the hectic screen. By using sound effects, you could give the user audio cues of what is happening during the gameplay experience. For example, if a sound effect that is played when the player gets hurt is played during gameplay, the player knows that the player got hit by an enemy. * There is not much UI screens in the game. It would be nice if there was a main menu and a screen telling the player how to play. If you added more UI screens, the game would seem more polished and professional and could make the gameplay experience more immersive and memorable for the player. Also, adding a screen that tells the player how to play will also be beneficial to the player. Though I read the instructions on the game page, I forgot some of the instructions. The game would be better if the instructions were told in the game, so that the player can refer to them if the player forgot about them. It would also seem more professional and polished for the developer to give the instructions in the game. This is because most games teach the player how to play in the game, rather than forcing them to read instructions outside of the game. Teaching the players how to play inside the game will be a great service to the players and will help them to actually get to the fun portions of the gameplay faster. *In addition, you forgot to tell the player what happens when the player exits out of a side of the screen. You forgot to tell the player that when the player exits out of a side of the screen, the player comes out of the side parallel to the side the player exited. By not telling this to the player, the player could not use this gameplay feature to make decisions. A player that does not know what happens when the player exits out of the side of a screen may first of all not know where the player's character is when the player comes out. This is because the screen is way too hectic and the player does not know where to look for the player's character. When I exited out of a side of the screen, I thought I exited the screen and I was "trying to get my character back to the screen". I did not know I was already in the screen area. Even if the player was quick to find the player's character, the player may be unfairly ambushed and attacked by an enemy. If the player knew about this exiting out of the screen rule, the player may have been more cautious to exit out of the screen. Also, if the player does not know this rule, the player may not be able to take advantage of it. For example, the player may try to avoid an enemy that is close to the player by exiting the screen so the player can come out from the side parallel to the side the player exited from and be far away from that enemy. * The UI of the game looked nice. I like how the buttons enlarge when they are hovered on. Moving objects is always eye appealing to me. The main menu was especially nice as objects were moving around in the background. * The soundtrack fit the eerie mood of the game. I liked it because it was disturbing to me. The strange and horror like sounds really fit the creepy and scary mood of the game. * The tutorial is poor. The tutorial is just one big chunk of text. Rather than teaching the player step by step by letting the player interact with the game's mechanics (as most good tutorials do), the game expects the player to read one big chunk of text, memorize it, and incorporate it in the gameplay's mechanics. This type of tutorial is bad because a player can easily forget the information from this type of tutorial and a lot of players, including me, will have a boring time reading the tutorial. Make the tutorial more fun. Since the tutorial was poor, it took me a long time to learn how to play. I was very frustrated when I did not understand how to play and I did not have fun with the gameplay because of the tutorial. * If I delete arrows in gameplay, there seems to be no way to restore them back. Sometimes, I might be able to delete all the arrows without filling out all the boxes. This results in me having only two options: 1) waiting until the timer ends if there is a timer or 2) Just exiting out of the game mode. I hate this feature and this makes the game boring. * Though the UI looks nice, it does not function very well. First of all, there are some buttons in the UI that do not function when clicked on. These buttons are the no button (which is spawned by clicking on the exit button) and the help button. Another problem with the UI is that there seems to be no back button to a menu that pops up due to the result of clicking a button. For example, if I click on the Arcade Mode button, a menu with three buttons will pop up: Easy, Normal, and Hard. I may change my mind and want to pick the Casual Mode, but there is no way for me to exit out of the menu with three buttons that popped up. * When first opening the game, the player is prompted a configuration window. The configuration window allows the player to change the screen resolution. When a player first plays the game, the player may change the screen resolution to create a smaller window for the game rather than playing with the default screen resolution. This may cause some of the elements in the game to not be visible on screen when the player is playing, as the window may be too small to show them. I would strongly recommend removing the configuration window in Unity because allowing the player to change screen resolution can crop some objects in the game out of the screen. Also, depending on your UI settings, it may even organize your UI differently when changing the screen resolution. I saw this happen to the title of the game in the main menu. In addition, you may also want to remove the configuration window because of the input screen in the configuration window. The input screen may confuse some players due to there being a lot of information. The input screen is not exactly explained too well, and it can be overwhelming and a burden to players. Also, your game may allow the player to change the values of the game's controls in the input menu. I am not sure about this. However, if this is true, please note that there really is no good reason for a player to want to change the values of the controls in the input menu. This is because the game's controls are so simple and common in many games. Many computer games have the player use the space bar to do important actions. Another problem is that if the player is able to make changes to the controls of the game, the game's tutorial will still show the player that the default values of the controls are the values of the controls even though that might not be true. If the game does not allow players to make changes to the controls of the game, then there really is no point in having the input menu. The input menu's only beneficial function is to allow the player to make changes to the controls to the player's liking. * The name of the game is Grey Space, but when opening the application, a different name is written next to the Unity icon in the application. This name written next to the Unity icon is clearly not a clear formal name for the game. This inconsistency between these two names looks unprofessional and this frankly ruins my immersion into the game. I think I fixed the glitch. Try playing the game again and see if the glitch is fixed. * The game tells the default values of the controls in the game. * The main menu has moving text and text that enlarges when hovered on. These texts look eye-appealing to me as my eyes like seeing texts that are not stationary. I think these types of texts look charming. * The gameplay is frankly uninteresting. These days, I do not really like endless runner like games in where the player can not actually win and finish the game. This is because the gameplay can get boring real fast as the gameplay can be pretty repetitive. In this game, there barely is a variety of enemies. Therefore, the gameplay can become easily become really repetitive. There is also not a very strong incentive in this game that motivates me to try my best. I do not really feel happy when I reach a good score because my work in this game is never finished. I never feel a final sense of accomplishment. In addition, I do not like that the player can kill an enemy while punching or kicking in the opposite direction of the enemy. This is because this does not make sense in real life. Fixing this issue can make the game much more fun and enjoyable. * The configuration window shown at the beginning of the game needs to be removed. First of all, if the player changes the screen resolution to make the window smaller than the default screen resolution, some of the UI of the game can be cropped out. Though it is possible to make changes to the UI to adapt to changes to screen resolution, there is also another reason why the configuration window should be removed. In the configuration window, there is an input section in the window, and the information presented here can confuse some players. This is because the information in this section is not exactly explained too well. There are many useless controls in the input window that do not get used and these controls can overwhelm and put a burden on some players. Modifying controls that are used in the game though can be risky as the game still tells the default values of the controls despite the modifications. This can confuse some players, especially players who forgot what values they assigned to the controls. Also, assigning two controls the same value can lead to glitched gameplay. Therefore, the configuration window should be removed. * The graphics of the game are not that interesting to look at. The graphics look way too simplistic and they do not really fit a certain style. They look unappealing. The moon in the game looks kind of blurry. Also, texts in the Game Over screen overlap. These texts look messy and almost unreadable. These texts and the graphics in the game make the game look unpolished and unprofessional. This ruins my experience of the game for me. * The game is not that great in explaining how to play. It took me some time to realize that I could only kill bats by punching them and I could only kill bugs by kicking them. The instructions that said to not touch enemies was kind of confusing. This is because in order to kill enemies, the player had to touch enemies, but the instructions told the player to not touch enemies. Though I later on comprehended what you were trying to say, the instructions should be clarified so it does not confuse the player. * The game had simple but challenging gameplay. The controls were simple and easy to learn. Even though the gameplay only featured one button (the space bar), it was still fun, entertaining, exciting, and challenging. * I only used two guns in the game so far, but I am pretty sure the graphics and the audio of all the guns in the game are as great as the two guns I used. I liked how realistic and detailed the guns that I used looked like. When I pressed the space bar, the gun sound effects sounded so realistic and the sound effects made me feel powerful. The graphics and audio of the guns and the perfectly used particle effects from explosions and gun shots made the guns realistic. These guns' qualities made me immersed into the experience provided by the game. * When first opening the game, the player is prompted a configuration window. The configuration window allows the player to change the screen resolution. When I was first playing the game, I changed the screen resolution to create a smaller window for the game rather than playing with the default screen resolution. This caused some of the objects in the game to not be visible on screen when I was playing, as the window was too small to show them. I would strongly recommend removing the configuration window in Unity because allowing the player to change screen resolution can crop some objects in the game out of the screen. Also, depending on your UI settings, it may even organize your UI differently when changing the screen resolution. I do not think this happened in the game though, so your UI settings might be adaptable to changes in screen resolution. However, I am not 100% sure. You will have to test your game to see if your UI is fully adaptable to changes in screen resolution. In addition, you may also want to remove the configuration window because the input screen in the configuration window seems totally useless. From playing the game, it looks like you didn't use Input.GetAxis so allowing the player to modify which button maps to what control is useless. This is because changing these values does not change the controls in the game. The input screen may even confuse some players due to there being a lot of information. The input screen is not exactly explained too well, and it can be overwhelming and a burden to players. In case you are wondering, it is possible to remove the configuration window in your game. * The directions of the game were not too clear at the beginning of the game. It took me some time to realize that I had to keep on going right to keep on progressing through the level until I eventually win in the level. I think the game would be better if it told the player clearly where to go rather than making the player find out by himself/herself. * The game was easy to learn how to play. This is because all the controls of the game were told by the game. In addition, the rules of the game were somewhat intuitive and made some sense in the real world. For example, if my ship ran out of health, the crew would die. The icons of the game were also intuitive to understand. For example, it is a safe assumption to assume that the heart icon represents health, so the number next to the heart icon is the amount of health points I have. * The audio fit the game's mood and was not repetitive. It sounded nice. The audio helped create a peaceful mood for the game. I really liked this peaceful mood as I was tired when I started playing this game. The gameplay also helped the audio create a peaceful mood. This is because the gameplay was not too interactive and most of the gameplay just consisted of reading. The gameplay was not tiring for me. Also, reading the texts in the game immersed me in the game and made me visualize in my mind of what was happening during the game. * The graphics of the game were pretty realistic. The animation at the beginning of the game looked somewhat realistic and it immersed me into the game. I really liked how the graphics fit the pixel style seen in lots of games. * I liked how the game works regardless of whether the application is in full screen or not. In some games, whenever I use the full screen option, the UI of the game does not adapt to full screen. Therefore, the UI of these games will be messily organized in the full screen mode. Thankfully, the UI of this game was organized well in full screen. * I did not like that the game went on to the next chunk of text without user input at the start of the game (which introduced the exposition of the game) . This is because I was not finished reading the text by the time the game decided to move on to the next chunk of text. When I replayed the game, I did not like that I could not skip the animation and go on to the next chunk of text. This is because I had already seen the animation and seeing the same animation over and over again is pretty trite and boring. I wanted to get straight into the gameplay after I lost and I did not want to waste my time watching the animation again. * Though I liked the pixel style for the graphics, I did not like that the text followed the pixel style. This is because the pixel style made it somewhat hard to read. In addition to this, some of the texts in the game were partially not visible as some of the words in the texts were written off screen. Yes, but usually it is the other way around in that the black is supposed to be the background part of the health bar. This is usually the case in video games I play. Since you made black be the foreground part of the health bar instead of the background part, I was initially confused as I thought I had close to no health when I had close to full health. I also initially thought I had close to full health when I had close to no health. * Mildly entertaining gameplay. Unlike other jam entries, this game can be finished. I usually like games that can be finished rather than games like endless runners. This is because I feel a sense of accomplishment when I reach the end of a game that can be finished and I feel good at the game when I beat it. It makes me feel happy and it makes me feel like I am a good gamer. I usually do not like playing endless runner like games because there is an endless pursuit of trying to do better and this can get tiring real quick. I also do not like these types of games since they are repetitive and I have to repeat the same gameplay over and over again. It feels like grinding. I would rather play games with interesting level designs that fascinate me. * I like 3D gameplay because it makes me feel free when I play rather than feeling cramped in a world space in 2D gameplay. There is so much space that can be covered in 3D and I just like exploring around like that. I find it fun. * The camera of the game made the game very buggy. It would sometimes go through platforms. This made the game feel really unpolished and unprofessional. This ruined the feel of the game and made the game somewhat unpleasant. * Lots of the elements in the game were very hidden and this made the game frustrating and difficult for me. In the first level, it took me some time to realize where the ball was located at. In the second level, I had to really focus my eyes to see the black platforms camouflaged in the background. In the third level, I kept on falling through the floor. I initially thought it was a glitch but finally realized there was a gap where I was falling through that caused me to die. These hidden elements made the game really hard for me and I did not like it. Any person that has eye problems and can not see too sharply might find these hidden elements even more frustrating. * The controls are not explained in the game. Even though I eventually found out the controls, I would have liked the controls of the game to be introduced to the player as I was somewhat confused on what to do at the beginning and it would be really convenient for the player to know the controls when the game starts. * The text at the beginning of the game is written in a font that makes it hard to read and I am pretty sure the writing needs to be proofread. * I liked the fact that the mouse was incorporated to aim and shoot at enemies. Using the mouse allows the player to move the gun more precisely. This is advantageous for the player because the player can more accurately point the gun at the enemies. * The sound effects for the player's guns sounded like the gun sound effects in good video games. These gun sound effects were pretty realistic . I like how the sound effects that occur when the player starts to hold the shoot button are slightly different from the sound effects that occur when the player keeps on holding to the shoot button. * The AI for the enemies was not bad as it provided challenge for the player since it could follow the player and shoot the player. *I would have liked the game to have explained the controls to the player even though the controls are written in the game page. This would make the game look more professional and polished. This would also make it more convenient for the player. Before I played the game, I read the instructions. While I was playing, I forgot some of the instructions. I had to go out of the application, reread the instructions, and then go back into the game. This was unnecessarily inconvenient and frustrating. * I think there should be a button that allows the player to exit full screen mode. This is because this would it make it more convenient for the player to look at other applications while playing the game. * Arrow keys should also be allowed as movement as well. I like using the arrow keys rather than the WASD keys as I have grown up using them to play many computer games. Allowing players to use the arrow keys for movement would make the game more accessible for players that like using the arrow keys. * The gameplay is boring because it fails to tell the player how much health they have. Since the game does not tell me how much health I have, I never feel tension and pressure when I am about to die since I do not know if I am about to die. * The gameplay is also boring because scores do not really motivate me anymore. I have grown tired of endless runners a long time ago. I do not find trying to achieve good scores a really strong incentive since it is an endless pursuit and there is no final achievement of accomplishment. * The gameplay is also boring because there are no varieties of enemies. Fighting the enemies feels like grinding, and it feels unpleasant as it is a repetitive task that does not really have any reward. * I do not like the death screen of the game. This is because I can still move around even though I am dead. Also, when I press the shoot button, the gun soundeffects play but no bullets come out. This mechanic seems like a bad glitch. * The UI of the game makes the game feel less polished, professional and it ruins the feel of the game and makes the game look unpleasant to play. I would like more detailed UI (for example: labeling the score during gameplay rather than just writing the value of the score). Also, when switching guns, why is the space between the score and the gun name different? * I do not see the necessity of making the player have two guns. Each gun does not seem to have a unique advantage. When I was playing, there really was no strategy of when to use each gun. The guns are not too different. Adding a second gun was an unnecessary addition to the game. It does not make the game more fun as it does not really add a layer of strategy to the game. * Finally, I do not like the borders of the game. When I was touching the borders and it would not allow me to move, I thought it was a glitch. The game would be better if it allowed the player to know if it was touching a border so the player will not think a glitch occurred since the border will not allow the player to pass. When I was playing the game, the white part of the bar was increasing when taking damage instead of decreasing. When I first started the game, my health bar was completely black. When all my health was gone, the health bar was completely white. The player’s health bar and the core’s health bar follow the same model in that the health bars become more white while taking damage. * Controls were explained in game, during play. This is good because it makes it easier to understand the game as I can apply concepts as I am learning concepts, rather than trying to remember a chunk of text of instructions, only to forget it during play. * Progress in the game is saved. This is good because the game seems to be long and some players might not want to lose progress as repeating the same sections over and over again can be trite and repetitive. * The soundtrack and graphics of the game fit the lighthearted cutesy mood. The game has a nice soundtrack that is not repetitive. The graphics and animation are decent and the animation has a nice style and makes the protagonist come to life. * I like how the title of the game in the main menu dynamically moves a little bit. It is a nice touch of polish and it is eye appealing and catchy. * Why does the player have to press the E button to go on to the next door? Why not allow the player to just go on to the next level by touching the door? In fact, I forgot for some time that I had to press the E button to go on to the next level when reaching the door in the level that was after the level where the E button's function in the game was explained. Seriously, there are no disadvantages when going to the next level from the door. Therefore, you should allow the player to automatically go to the next level when touching the door as there is nothing for the player to lose if the player goes to the next level . It is not like there are collectibles in the levels or anything, so there is no reason for the player to just stay in the same level. * In this level shown by the image below, there are no good hints telling the player where to go. First of all, destroying the top two blocks was very hard for me. Where do I go from here though? Am I even going through the intended route of the level? I strongly recommend having other people, preferably anyone that does not have any biases like random people on itch.io, playtest your levels as the developer of a game is the worst playtester of that game. Information that might seem obvious to you is not so obvious to the players. * I think the player should be told that pressing the Escape key will exit the application. I have pressed the Escape key numerous times trying to go back to the main menu, but have accidentally exited out of the application. Speaking of going back to the main menu, I think there should be a way for the player to go back to the main menu anytime during gameplay. * There should be a proper credits menu for the developers of the game, rather than just writing the names in the main menu. This is because it makes the main menu look unnecessarily a little bit messy, unpolished and unprofessional. * The UI was nice and made the game look professional and polished. It made me feel good while playing the game. I liked the menus and I especially liked the item purchase menu as it looked nice, professional, and it reminded me of games I played. * I like how many different and interesting mechanics were incorporated. The combination of mechanics made the game pretty different. I particularly like how the health decreases when the player attacks an enemy. It is a different way to approach health in games. * The soundtrack was not repetitive and it sounded okay. It kind of fit the mood of the game. * There are some fixes that need to be in the How To Play section. The technical writing (like spelling, grammar and punctuation) of this section needs to be better. For example, there are some letters that are capitalized, and they are not supposed to be capitalized. There are some letters that are NOT capitalized, but they are supposed to be capitalized. Also, the controls do not mention movement using the arrow keys or WASD keys. * There are some gameplay tweaks that should be made. The click to attack is kind of hard and awkward to use. The reason why is because the attack only moves the player a specific amount of distance. Due to this, it can be frustrating to attack enemies that are nearing the core because when the player attacks one enemy, the player will unnecessarily move pretty far away from the core because of the amount of distance the player moves during the attack. In addition to this thought, I think the game would be better if it had the click attack AND had a mechanic in where if the player touches an enemy, the enemy will be destroyed. However, this distance problem should be tweaked so the player does not move so far away after attacking an enemy that is close to the player. I also think it is quite inconvenient for the player to have to press the space bar to pick up coins. After all, there are no disadvantages to picking up coins. I think it would be better if the player picks up the coins by just touching the coins as there is not a scenario where the player will not want to pick up coins since there are no disadvantages to picking up coins. Also, the four turrets in the beginning of the game do not attack the enemies. What is the purpose for these turrets if they do not attack? * When most games deal with health, they usually have a health bar that decreases when taking hits. In this game, the bar increases. I do not like this because this was confusing to me. I initially thought I had plenty of health when most of my bar was white and not much health when most of the bar was black. This seems like an unnecessary change in the game and I do not think that you should change just for change's sake, unless you fully know what the change will bring. This mechanic is confusing as I have learned from games that the health bar decreases when the player takes hits. * Instructions on how to play were explained clearly and simply. The game was pretty easy to understand how to play. * The gameplay was mildly fun. I do like how the asteroid moves fast downwards when it has a lot of health and that it moves slower downwards when it does not have much health. The vertical speed of the asteroid showed how well or how bad I was doing, and this kept me engaged and created tension. Overall, this game was pretty relaxing though, and I liked the relxation. The game design was not too cluttered unlike other games. * The soundtrack was nice and was not repetitive. The soundtrack also fit the mood of the game. * Instead of using to two buttons on the keyboard, it would have probably been better to use a mouse. You could have used a mouse by making the player move based on the horizontal position of the mouse cursor. This would have been more fun and fit the simple gameplay. This would have make destroying planets and avoiding obstacles feel more fun, since you can move more precisely with a mouse and this can add a layer of challenge to the game. You can not do the same with two buttons on a keyboard though. * Instead of having the player manually restart the game by pressing a button, why not just automatically restart the game like in Geometry Dash? The player should not have to unnecessary press the same button again and again just to play another match in the game. * The UI's graphics looked good. It was clean and polished. * The graphics and explosion particle effects looked great and it fit the game. * I like the +1 sign and the score written above the player's head in the gameplay. It was a nice touch of polish and it makes me feel more immersed into the game. These UI elements make the game feel more polished, clean and professional and I like this as it makes me feel good. * There are some concepts that I do not like with the UI menus. First of all, I did not know that the button with the arrow graphic in the menu titled "Space Breaker" would exit out of the game because I did not understand the button's graphic's message until I clicked the button. Second, when using the back button in the menus titled "How To Play" and "Credits", it goes back all the way to the menu titled "Space Breaker". I would have liked it to go back to the menu titled "Menu" as this would be more convenient for me as I wanted to explore other options in this menu. *There is a glitch in where the music stops when you go the menu titled "Menu". The mood of the game is really ruined when the music stops. * I did not like how the rules and controls of the game were explained. First of all, they were hidden inside a menu. The instructions should be more accessible, at least for the first time the player is playing. Also, the instructions on the rules of the game were pretty confusing. The instructions were saying to avoid crashing into white asteroids and do not properly explain why, and then the instructions say try to crash into all asteroids during the last sentence. *I would have liked the player to be controlled with the mouse instead of using two buttons on a keyboard. This type of game is well suited to use a mouse as there is not much that the player does. The game would be much more fun with the mouse rather than using two arrow keys. You could have the player move vertically using the mouse's vertical movement. * Finally, the gameplay lacks entertainment. Personally, I do not really like a lot of endless runner games these days because they lack objectives. Sure, in this game I could try to get a really high score, but this game fails to keep me motivated. When I was playing, I barely cared about crashing into white asteroids. This game did not keep me motivated to try in this game as there were not many strong incentives. The background is also too cluttered and it is very distracting. It sometimes makes it hard for me to play well. * I liked the checkpoints. They made the game less frustrating. They also made the game less repetitive as I did not have to keep on repeating the same sections over and over again which would have been annoying for this platformer. * I liked the mood of the game. The game's smiles and great soundtracks made me feel calm and relaxed. * I liked the twist in the ending in where the player can actually trigger a different ending. This made me feel surprised and made me appreciate the effort you put to craft this game. * I do not understand why I have to use the Z key to jump. It made me unnecessarily have to use two hands to play the game. I would have liked to be able to play the game with one hand easily. * The graphics and text of the game are kind of a little bit sloppy. I know they are supposed to add towards the mood of the game and make it feel lighthearted, but sometimes the text could look a little too messy and the graphics could look pretty messy when moving. * I think there should be a play again button in the ending. As a player, it is annoying to have to reopen the game again in my File Explorer to play the game again. * I liked how the controls were pretty simple. I just had to use a mouse to drag the planet and that was it. I did not even have to use my keyboard. * I liked the soundtracks. They did not sound repetitive and they sounded nice. Also, the soundtracks fits the mood and feel of the game. The soundtracks made me feel calm while playing the game. * I liked how interesting it was to manipulate the rockets to crash. Doing this made me feel clever, and there were tons of ways Icould make the rockets crash which I found immersive. I particularly liked crashing one rocket into another rocket, but crashing rockets into rocks were fine too. * I did not like how the instructions were presented. Though I liked the fact that the instructions were told in the game, I did not like that the instructions were just told by a big chunk of text. When I read the big chunk of text and started playing, I kind of forgot the instructions (I remembered using the mouse to move but I did not remember how to lure rockets towards me). * I did not like the fact that when the player dies, the player has to go back to the main menu again to play. I did like this when I first started playing, as I forgot the instructions, but I did not like it after the first time. It felt repetitive to go back and forth between the menus. * I did not like the camera of the game. Since the camera was too zoomed in, I could not see rockets from far away and I sometimes was afraid to move in fear of getting hit by a rocket that I saw at the very last second before my death. For those wondering how this game matches the theme, this game matches the theme “Space” because the player uses the Space Bar in the game. In addition, this game matches the theme “You Are The Weapon” because the player is a weapon that can shoot enemies. Can you show me a screenshot of where that happened? I have added a post-jam version in my game. The post-jam will only have bug fixes. If the original game is not working on the browser, try downloading the post jam that I have put in my game. If that is not working, try downloading the original game with the itch.io desktop app. * I thought the controls in the game were prettty simple. I quickly learned how to play the game very easily. I also liked the fact that you told the controls in the game, and did not just expect the player to look at the description for the controls. Also, the controls were explained very clearly in a basic matter. * I liked the polish of the attack. The sound effect and the way the screen shaked when I pressed the attack button made me feel powerful, and I liked feeling that. * I liked the UI of the game because it was simple, clear, and did not clutter the game. It added to the feel of the game, and did not detract from the experience. * There is an exploit in the game which makes the gameplay extremely easy. What I did in the game was that I just spammed the space bar continuously, and doing this made the gameplay a lot easier for me as I did not have to worry about dying. If a bullet was heading towards my direction, I was usually able to destroy the bullet easily as I was spamming the space bar. * I disliked the fact that the player is shot at as soon as the player starts. When I first started and did not know about the exploit of the game, I just died as soon as I started a game. I thought that this was unfair as I did not even get a fair chance to grasp the concepts on how to play the game. * The graphics are very distracting and detract from the experience. When I was first playing the game, I thought the background stars were part of the game and I was worried that they were bullets. Also, I did not even know where I was when I first started. After a couple of games, I later on found out that I was the object that looked like a crosshair and I was not one of the space ships in the game. * The game felt pretty relaxing due to its sound track and gameplay. I didn't feel any pressure in the gameplay. *The gameplay was pretty interesting. It was different and the gameplay felt pretty immersive as the player was given simple mechanics and there were multiple creative solutions the player could come up with those mechanics. I, for example, tried building stairs with bullets. *The soundtrack was pretty interesting and not repetitive. * I disliked the lack of a tutorial. Since there was not a proper tutorial, I was confused on how to know when to use the mechanics properly. For example, other than cosmetic differences, I do not understand the differences between bullet types. * After a lot of bullets, the game could get pretty messy and this did not look nice. Sometimes, I might have accidentally surrounded myself by a bunch of bullets with no way to escape. The only solution I had was to keep on shooting until the level reloaded again so that the level would not have any more bullets. * The controls were pretty strange and unusual. I particularly did not like using the Z and X button and I thought there were too many buttons in the game. It would have been better if there were less buttons so the player experience wouldn't feel so awkward. * The UI, particularly at the main menu of the game, looks messy. The text is almost unreadable and this did not make me feel good. 2 Colors Game Jam community · Posted in Can We Use Only One Of The Themes? Also, in addition, can we use the themes abstractly? For example, maybe naming one of the characters after the theme? 2 Colors Game Jam community · Created a new topic Can We Use Only One Of The Themes? Do you have to use both themes or just one of the themes? * This game is very polished. I like the style of the black and white graphics and I like how the soundtrack of the game provides the mood of the game. * This game is too difficult. I think it is unfair for the player to have to restart a level every time the player dies in the level as the levels in the game seems to be very long. I think the game would be better if there were checkpoints. * The game had good polish. It had great graphics with excellent animations and good music. * The difficulty of the gameplay. I was not able to escape from the first enemy in the game. It was too hard. I also thought that the lack of a replay button in the "Game Over!" screen was frustrating because I had to open the game in a new tab and exit out of the old tab. That was tedious. * The game was somewhat polished. Even though the game over sound effect was too loud in the "Try Again" screen, the graphics and sound were good. The graphics were simple, but colorful and decent. * The game was too difficult. I would recommend getting someone to play your game before publishing so that they can give feedback on adjustments. This is because games developed by a developer is obviously easier for the developer than for players. Therefore, it is wise to seek player feedback so that you can tune and adjust some of the mechanics of the game. Doing this can make the difficulty more comfortable for the player and make the game more fun. *The gameplay concept was pretty interesting. *This game needs better polish (particularly better graphics and some sound).